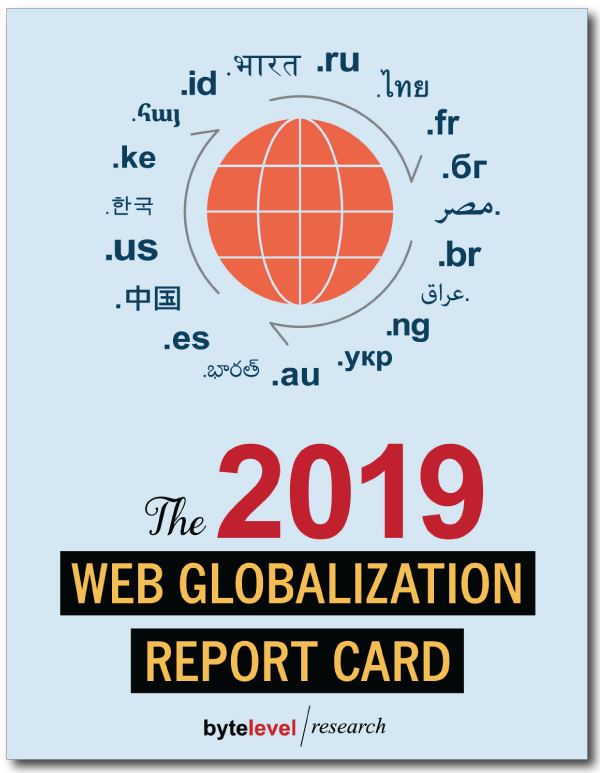 The 2019 Web Globalization Report Card benchmarks the world's best global websites — and how they got there. What languages must we support? What languages are most popular on the internet? What emerging trends in localization should we be aware of? What do we need to know about China compliance and our website? Why are flags such a danger to use on websites? Who is doing the best job of localizing models? How do we build a truly user-friendly global gateway? How is our global website doing compared with our competitors—and why? What common mistakes are companies making with their websites? How do we design a website to best manage diverse brands and diverse locales? This report, now in its 15th edition, answers these questions and many more. You’ll learn which companies have improved their global and mobile websites — and why. Through website profiles, loaded with screen shots, you'll learn which practices to emulate and, of equal importance, which to avoid. More than a dozen industry sectors are profiled, with key web localization developments and best practices highlighted with visuals. This year, like years before, we benchmarked 150 websites across more than a dozen industry categories. These websites comprise 80% of the companies on the Interbrand Best Global Brands 2018 list and more than 30% of the Fortune 100, ensuring a broad reach of the leading global brands and businesses. Never before have companies been expected to support so much content across so many languages and across so many devices. And while this continues to be a very exciting time to be involved in web globalization, it’s also quite challenging. This report serves two purposes. First, it calls attention to those websites that have excelled in the practice of web globalization. The companies that have made the top 25 did not get there by chance. The people who have helped raise their websites onto the top 25 list deserve recognition for helping their companies communicate effectively with the world, regardless of language, culture, or geography. Second, this report identifies emerging trends (both positive and negative) to help you avoid the painful missteps that others have already taken. This report is designed to help you guide your web, marketing, content, mobile and local teams to positive, efficient action. Founded in 2000, Byte Level Research was the first firm dedicated exclusively to the art and science of web globalization. We have consulted with hundreds of multinationals and have learned what works and what doesn't work and, just as important, where their websites are headed. This expertise is carried over into the methodology of the Report Card, the first report dedicated to best practices in web globalization. The report is relied on by some of the most innovative global and consumer product companies and we are proud to have many clients who have purchased this report for more than a decade. Every year, we conduct a hands-on analysis of the world's leading websites, analyzing how web designs are shared across countries and mobile platforms, noting languages used on every website. We study local content, visuals, social media, website weight (in kilobytes), and navigation. This information, along with 15 years of historical and linguistic data, will help you benchmark your company against competitive and “best of breed” sites such as Google, Wikipedia, Amazon, IKEA, NIVEA and Booking.com. A combination of quantitative data and practical, hands-on advice make this report an invaluable resource for any company doing business across borders. After payment, we will contact you to coordinate delivery. Joining Wikipedia on the list of the top 25 websites are regulars such as Google, NIVEA, Adobe, and Philips. New to the list this year are Uber, Volvo, and Emirates. The teams behind the websites featured in the top 25 all deserve a round of virtual applause. We know how difficult it can be to build the case for supporting languages -- and how one must continually battle to support usability for all users, not just those who speak the dominant languages of the executive team. Actions speak louder than words. Despite all the talk of walls and Brexit, companies continue to expand their global reach. The average number of languages supported by the leading global brands is now 32 languages—more than double the number of languages from a decade ago. There’s a good reason Google ran an ad for Google Translate during the Super Bowl. The internet may connect computers but language connects people. Google Translate supports more than 100 languages—and acts as a linguistic “front end” for many websites. Uber is on a language-expansion streak. It added 11 languages over the past two years—and now supports 46 languages. Volvo finished as the highest-scoring automotive website. The average number of languages supported by the companies on this list exceeds 60. The ideal global gateway location: Header or footer? What do desktop websites get that mobile websites lack? What are the global languages? Absolutely not. We have never and will never accept money in return for inclusion within the report. Some of our consulting clients over the years have been included in one or more reports and they have used our methodology to help drive positive change within these organizations. We take pride in creating a report that is self-funded and completely independent in focus, content, and findings. Report author John Yunker reviews every website — and has done so for every edition of the report. No work is outsourced. This historical understanding of each website (combined with one-on-one interviews with many of the executives who manage these global websites) provides invaluable and actionable findings and recommendations. We survey a wide swath of global companies across all major industries to provide a well-rounded overview of the state of web globalization. Within each industry, we include the leading companies with a focus on brand leadership. We include more than 30% of the Fortune 100 companies and 80% of the 2018 Interbrand 100 Best Global Brands. Many of the companies benchmarked within this report have purchased the report for multiple years. Purchasers include Cisco Systems, Deloitte, Panasonic, FedEx, Philips, and The World Bank. There are companies not included in this report that also use it regularly, such as global consulting and IT firms and various government agencies. Global Reach (Languages): The website supports enough languages to reach a wide global audience. To receive a maximum score, the website must support 48 languages. Emerging globalization trends within specific industry sectors, including languages, commerce, and cultural customization. Some clients elect to combine the presentation with onsite training and cross-team meetings. Over the years, John Yunker has presented at dozens of companies across three continents. Please contact us for more information. Since 2000, John Yunker has helped hundreds of companies improve their global content, websites and software. He authored the first book devoted to the emerging field of web globalization Beyond Borders, as well as the newest, Think Outside the Country (also available in Japanese). John speaks at numerous industry events, including Localization World, Internet Retailer, and the Unicode Conference and has been quoted on global topics in publications including The Wall Street Journal and The New York Times. He writes the popular web globalization blog Global by Design.